Having completed their survey of Bach’s church cantatas, Mazaaki Suzuki and his Japanese ensemble have moved onto the secular repertoire. This is the fifth volume to be released in the secular cantata series, but it’s my introduction to this follow up project. Given the overlap in the actual music, Suzuki has wisely made a subtle change in the recording profile to distinguish the secular works, moving from the Kobe Shoin Women’s University Chapel to the Saitama Arts Theater Concert Hall. The hall has a suitably rich and resonant acoustic, but is just a little drier than the chapel and is clearly a distinct acoustical environment. 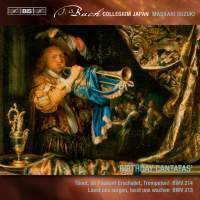 The liner notes tell us that the first of these two cantatas, BWV 214, was written for outdoor performance, so the limits of Suzuki’s verisimilitude soon become clear. On the other hand, a female soprano would presumably have been a more likely proposition outside of the church, so that aspect of Suzuki’s performance surreptitiously falls into line with 18th-century practice. Suzuki also has a new lineup of soloists. Tenor Makoto Sakurada made a few appearances in the church cantatas, and countertenor Robin Blaze was a regular, but soprano Joanne Lunn and bass-bariton Dominik Wörner are new. Blaze remains the standout voice here, but all give strong performances. Lunn has a highly disciplined Baroque technique, with just the faintest of vibrato on the held notes. A little more expressive freedom might have made her arias more attractive. Wörner replaces the long-serving Peter Kooij, and has a similarly light voice. Presumably this is Suzuki’s preference, but I’d rather hear a more substantial tone in the lower registers. The soloists are all linked to allegorical characters in both cantatas, yet the dramaturgy here is slight. Both works are birthday cantatas, Lasst uns sorgen written for the 11th birthday of Saxon Electoral Prince Friedrich Christian (represented in allegorical form by the countertenor) and Tönet, ihr Pauken for Maria Josepha, Queen of Poland and the Prince-Elector’s wife. The texts may link the works with these celebrations, at least on an abstract level, but most of the music will be familiar from elsewhere, specifically the Christmas Oratorio, written the following year (the canatas 1733, the oratorio 1734) and borrowing liberally from both works. Given the title of Tönet, ihr Pauken it is little surprise that this is the source of the oratorio’s opening chorus, but many of the aria’s are also reused, the texts of course changed. The forces here are considerably smaller than in most recordings of the Christmas Oratorio, which is probably the most significant factor distinguishing this recording from more traditional seasonal fare. But, as ever, Suzuki carefully balances the voices and instruments, and the results display his trademark clarity of line and texture. The listed instrumental soloists are oboe (and d’amore) player Masamitsu San’nomiya and violinist Natsumi Wakamatsu. San’nomiya is on excellent form in the BWV 213 aria “Treues Echo dieser Orten” and both come together for a fabulous double obbligato in “Auf meinen Flügeln”. Also worthy of mention is trumpet and horn soloist Jean-François Madeuf. He takes a fundamentalist approach to period performance, eschewing the anachronistic tone holes that keep other Baroque trumpeters in tune. He was a late addition to the orchestra in the church cantata series, and there is a certain roughness to his sound that is probably an automatic consequence of his equipment. But it now fits into Suzuki’s otherwise immaculate sound, adding some real character to the choruses the brass obbligatos. The SACD sound (heard in stereo) is up to BIS’s usual high standards, and the documentation is exemplary, with full texts and translations included.